An over view of the Japanese chopstick etiquette guidelines set in stone by the chopstick Gods themselves. So here it is, a basic list of etiquette when it comes to eating with chopsticks in Japan. 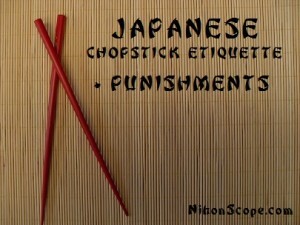 I thought I also give you the regular punishments that happen in Japan for disobeying the chopstick gods. The punishment must be appropriate to the offense, may the Chopstick Gods have mercy on your soul! I hope my utter nonsensical punishments help you remember your manners when eating with chopsticks! Remember, the chopstick Gods are ALWAYS watching you, judging every move you make with your chopsticks, so pay attention, and stay alive! look childish. Practice eating with chopsticks a quarter past the middle. Punishment? Wait? You don’t think looking childish in front of a bunch of people is enough :P? in front of you with the tips to the left, if you place them to the right… well. Just don’t! You don’t want to know what happens. 3. Hiroi-Bashi – Avoid at all costs of being cast into the ocean by passing food from your chopsticks to another’s. This practice is purely used at funerals which involves the bones of an ashed and cremated body. 4. Tsukitate-Bashi – Avoid ever sticking your chopsticks straight into your food, especially into gohan/rice. This is another act done at funerals with gohan/rice that is put into an altar, doing this could get you shipped off to Pyong-yang in North Korea. 5. If you spear your food with chopsticks, a kung-fu master will spear you. 6. Utsuri-Bashi – If you pick a piece of food up and then decide you don’t want it and you put it back down to pick something else up.. That’s called a no-no, soon after you will start to see black and white spots in your vision from the local Shinto priest casting magical spells on you under the direct guidance from the chopstick Gods. 7. Mayoi-Bashi – If you’re indecisive about what you want to eat from your plate or community platter, avoid hovering your chopsticks over food. This is seen as greedy, and you’ll be sleeping with the pigs that night! 8. Sashi-Bashi – If you point with your chopsticks, your Grandmother will be sent to the disposable chopstick work camps based in Hokkaido where she will work until her end of days. 9. Koji-Bashi – Avoid digging for that perfect water-chestnut or french onion, always pick up food from a bowl or dish that’s easy to get to (you know, the top). You’ll be headbutted by the nearest Japanese person if you do so. 7. Waving your chopsticks in the air or playing with them will get you sent to the kiddie table. 8. If you need to tear a piece of food apart, use your chopsticks. This takes practice! But you know you can do it. It’s acceptable to pick up larger pieces of food like tempura and take a chomp out of it. 9. Don’t spread Koodies, if you’ve eaten food from your chopsticks, don’t pick up food from community platter or shared plates with the eating end. Turn your chopsticks around and take from the plate that way and bring it back to your plate first before eating it. You’ll not go to chopstick heaven when you die. your free hand under the chopsticks while bringing it to your mouth. 11. Yose-Bashi – If you feel frisky you can play with and move your dishes and plates around with your chopsticks. But do this with extreme caution as you will wake the Japanese fang-gore beasts and they’ll eat the cutest puppy and kitten you’ve ever seen right in front of you. (@_@) You’ll need years of therapy..
12. Neburi-Bashi – By licking the ends of your chopsticks, you will not only look like a total gaijin, you will be asked to pay the bill for your entire party and if you don’t, your Grandmothers freedom again is at risk. Don’t be licking the ends of your chopsticks! Very important to remember. 13. Do not swirl your chopsticks in your soup. Why? Because you just don’t do such things in Japan. Be respectful, do that behind closed doors. 14. If you cross your chopsticks when putting them on the table you evoke great wrath from all those around you. This is another touchy moment for the Japanese as it’s another symbol which is used in funeral ceremonies.